Prototype: German Federal Railroad (DB) type Rlmmps 650 heavy-duty flat car, loaded with an M 48 combat tank for the German Federal Army. Model: The flat car frame is constructed of metal. Load restraints are included. The model of the military vehicle has an underbody and superstructure constructed of metal. 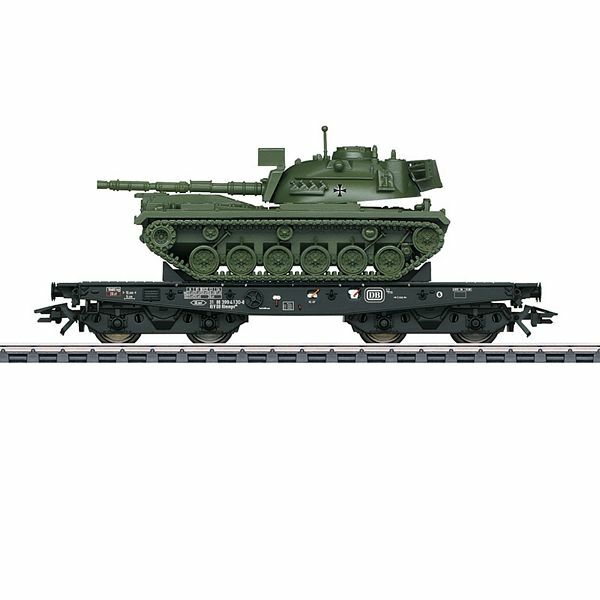 Caterpillar tracks and other separately applied components are made of detailed plastic parts. The turret and the weapon can be moved. The unit has an olive green paint scheme. The unit is lettered with identifying marks. Length approximately 7.7 cm / 3", with the cannon 11.1 cm / 4-3/8". The model of the military vehicle comes from Schuco. Length over the buffers approximately 12.4 cm / 4-7/8". DC wheelset E700580. Cars to go with this car can be found in the Märklin H0 assortment under item numbers 48796, 48798, and 46936. Examples of locomotives to go with this car are the class 194 electric locomotive (item number 39225) or the class 050 steam locomotive (item number 37836).